Ladbrokes. The name alone conjures up images of the smoky betting shops of old full of men in flat caps trailing cigarette ash and laying down pound notes. Times may have moved on, but Ladbrokes as a brand have retained a certain amount of that antiquated charm without leaving themselves open to accusations of being out of touch. If the company itself is old (did we mention that the company is very old?) the online casino is still in its infancy by comparison, only opening in 2000. Their journey to this point has been long and complicated, with aggressive marketing and growth strategies seeing them build an army of staff numbering into the tens of thousands and their shops dominating the high street. They might be better known as a Sportsbook, but the Casino hasn’t suffered as a result. The main benefit of betting with Ladbrokes (or Ladbrokes Coral Group plc as they are now known) is the obvious fact that they are also a bricks and mortar bookie, so you can deposit and withdraw in cash or online using the same account. Exclusive Ladbrokes tables in the Live Casino, huge Jackpots, state of the art branded titles and a broad range of exciting content are just a few more reasons to join. However, being one of, if not the biggest name in the industry also brings with it some pretty hefty expectations. Let’s see how this industry behemoth holds up. This is a big site with many layers and pop-up windows, so if you like things simple it might not be to your taste, although it does have a lot to offer. Both the instant play and download versions of the Casino run on Playtech software for a start, so while it might be hard work to navigate at times, you know at least that the site won’t let you down. It’s a bit of a mixed bag in all honesty because on the one hand functionality is fantastic, the site as a whole works like a charm and incorporates neat little touches like reactive game tiles and the ability to create a Favourites list; but we find the overall design somewhat uninspiring. The general tone is warm and welcoming enough thanks to the red colour scheme and familiarity of the brand, but the interface is blocky with too many options and duplicate areas; it hasn’t quite left the last decade behind. The biggest problem lies in the way the site has been forcibly split up. The Casino page hosts everything Playtech including some brilliant branded content, but this forces all of the slots by other providers to live on an otherwise unnecessary page called Slots. 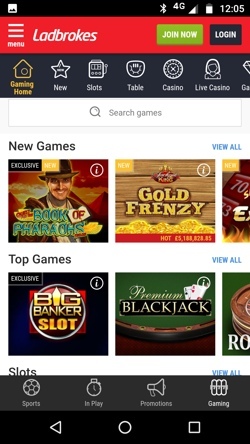 Then you also have the Games page, which is essentially another casino with a mass of alternative content including yet more slots and, arguably, a better layout and search capabilities. It’s akin to a department store spreading the shoe section over three different floors; it’s just annoying, and it shouldn’t be this difficult to search the game catalogue. It’s a good job the Help icon is easy to find. With all of that said, let’s take a look at the games, because there is a cracking selection. The Casino obviously hosts Playtech titles only, but elsewhere Barcrest, IGT, NextGen and NetEnt, amongst others, also lay out their stalls. Slots – The 80 or so Playtech titles in the Casino include tough and dependable John Wayne, and Little Britain for the comedy fans – don’t tell us: yeh you know. Elsewhere on the site a further 300 can be found including Gonzo’s Quest and Motorhead for all you mean machines. Live Casino – Commanding a page all of its own, the Live Casino is operated by everyone’s favourite: Evolution Gaming. Roulette = 15 tables + 1 exclusive; Blackjack = 30 tables + 3 exclusives; Baccarat = 16 tables; plus 5 other games such as Poker, Sic Bo and Dragon Tiger. And if you want more Poker guess what? It has its own dedicated page elsewhere on the site. Table Games – There are more than 50 games in the Casino alone, not to mention other areas of the site. These include Age of Gods Roulette, Buster Blackjack, Craps and, for those special evenings, Tequila Poker. Jackpots – With 30+ titles, some reaching 7 figures, could your luck be in? Playtech’s partnership with DC Comics serves them well allowing games like Justice League and Man of Steel to take pride of place. Video Poker – Making more of an impact than you see at other casinos, 15 Video Poker games are available to Ladbrokes players. Joker Poker is a favourite of ours. Casual Games – Scratch cards and the like. There are some real gems among the 30ish games in this category. You’ll find Rocky Balboa showing you ‘how winning is done’ in Rocky Scratch, and even simpler is Heads or Tails. There’s even the playground favourite Rock, Paper, Scissors. 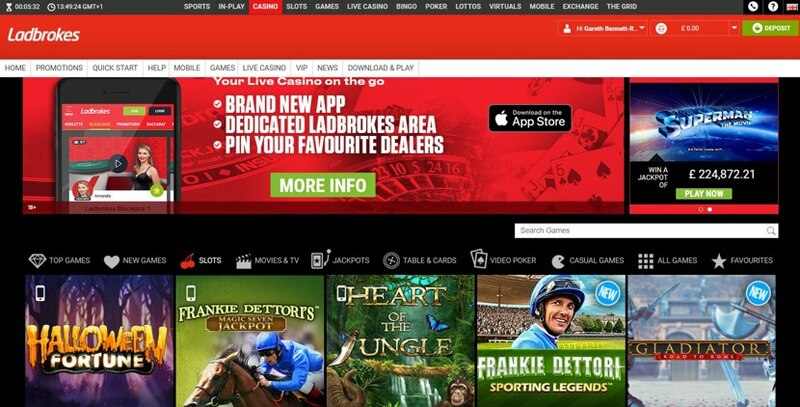 As well as a fully functioning mobile optimised site, Ladbrokes operate no less than 8 apps (six on android). The one you are looking for is called Casino & Games, and she’s a beauty. The two products differ ever so slightly, but there is no difference so serious that it could alter the user experience. Considering the amount of content they have had to pack into their mobile offerings both the site and the app run and quite a pace. They look fresh, more modern than the desktop site, and feel fun and intuitive to use, showcasing only the most important features on the home screen. Clutter be gone. Of course, they have had to split everything on the desktop site into manageable sections to work effectively on mobile devices, and this happy accident has improved the user experience no end. On both the mobile site and the app you can whip across to one of Ladbrokes other products (Sports, Live Casino etc) in no time from the side menu, and all of those extraneous task bar options are either gone or hidden away safely. You won’t tire of the game library either, since around two thirds of the titles are ready and waiting to be played on the go. There is a bigger than average selection of deposit and withdrawal methods at Ladbrokes, without them going too crazy, and most deposit minimums are a mere £5, with players able to set their own maximums. Withdrawals over £30,000 will need to go through the customer support team, but it’s good to see that there are no fees attached. The table below shows all the information we could garner from the website, but we found contradictory numbers and even the customer service rep didn’t seem to know some of the limits, so if you want to do anything out of the ordinary we would strongly suggest that you check with Ladbrokes first. Incredibly, the company can trace their roots back to 1886, making them the oldest surviving bookie in the UK and probably the world. Much has changed over the course of time, however, and the company which once counted only the upper echelons of London’s high society among its customers is now accessible to literally anyone. Ladbrokes Coral Group, as it is known these days, employs over 16,500 staff and operates 2,700 shops on high streets throughout the UK. This household name has a long and complicated history full of acquisitions and mergers, scandals and successes. Pre WW2, for example, the company showed class and vision by making Helen Vernet a partner in 1928 (yes, a woman) and she remained there until her death almost 30 years later. Post WW2 the company was running into various problems caused by the economic climate and a drop in custom, but by 1967 – 6 years after the government legalised betting shops – they were floated on the London Stock Exchange. The next 5 years saw Ladbrokes’ fortunes explode, growing from 50 shops to 1,135! A few decades later having survived a bribery scandal and dabbling in the Hotel, DIY and Real Estate businesses, Ladbrokes bought Coral for the first time in 1998 – only to have to sell the company on a year later due to the acquisition being found to be anti-competitive. They tried again more successfully in 2015, completing the acquisition of what was now called the Gala Coral Group in November 2016 – although similar problems meant that they had to sell off around 400 shops before the deal could be closed. 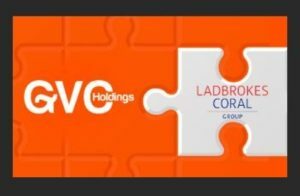 Thus, Ladbrokes Coral Group plc was born… and was then promptly bought by GVC Holdings plc, completing in March 2018. Phew! There are certainly plenty of options when it comes to getting help and advice from Ladbrokes, but as with big companies in all industries, they lack the human touch. There isn’t much in the way of personality and it all feels a bit soulless. The Live Chat opens in a new window so you can get on with other things as you talk, and it also serves as a self-help centre of sorts. As you whittle down the nature of your query you are offered FAQ articles that might match. You don’t have to use them, you could just hit Start Chat, but it’s a sensible and genuinely useful way to operate. The team member we spoke to was ok, but for a while we weren’t sure if he was human or a bot – we got there eventually. The good news is that the Live Chat is available 24/7, with the phoneline open 8am-10pm each day. This may be a better option if you want a constructive conversation. There have been worrying reports of late that player complaints have been ignored, and even worse, that payouts have been withheld for dubious reasons. These things are rarely black and white, and as we aren’t directly involved we can’t comment either way, but be aware and maybe read the T’s and C’s thoroughly before you jump in feet first. Live Chat – Found in the Help section. It’s buried a little deeper than is necessary, but that is a character of the site as a whole. Can also be accessed via Banking. 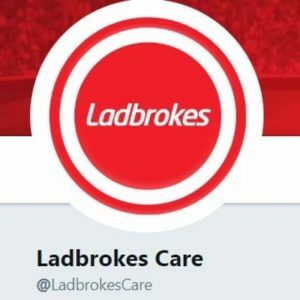 E-mail – There is a contact form in the Help section but you can go direct too; try either support@ladbrokescasino.com or care@ladbrokescasino.com – you should get a reply within 24 hours at the most. Phone – Gaming Customer Support is available from 8am – 10pm on 0800 032 1133. Other numbers are floating around the internet but these are for different departments, such as Sports Betting for example. @Ladbrokescare – There will be someone here 8am-12am and they are responsive. Nice to see an ancient bookie embracing the modern world.